Coal exporters not backing down despite glut; could China enter the market too? Even though global coal production has swelled up, there have been no signs of production slowing down in major coal-exporting countries, stretching the already oversupplied market. Global coal oversupply has been a major contributing element to the current weak coal market conditions. According to data available with SNL Energy, coal shipments from seven major exporting countries during the January-May period were roughly 40% of the total coal export targets estimated for these nations during full 2014. A Reuters report said global market for seaborne thermal coal will be oversupplied by roughly 10 million tonnes in 2014. Bank of America Merrill Lynch has forecasted a global surplus in metallurgical coal over the next several years despite an estimated 20 million tonnes of announced production cuts. The growing surplus and slowing demand is prompting some to forecast a shift in Asian import-export trends. China, which had turned into a net coal importer in the recent years, could return to being an opportunistic coal exporter within the next couple of years, as the country looks to hit its peak coal consumption in 2016, declining thereafter, Tim Buckley, director of energy finance studies at Institute of Energy Economics and Financial Analysis, told SNL Energy. Coal shipments to China, the current largest coal importer in the world, totaled 327.1 million tonnes in 2013, almost 192 million tonnes more than what was shipped in during the same period by the next big importer, India. In May, China's coal imports were 24 million tonnes, compared to 15.6 million tonnes imported by India. China still consumes 50% of the world's thermal coal and forms 20% to 30% of all the coal import demand today, making it the driver of the global seaborne coal demand, Buckley said. On the other hand, there have been numerous factors signaling India was still way behind in steering the global coal export market. India recently got a new prime minister, who has been focusing on revitalizing domestic energy production rapidly, including of coal, Buckley added. The Indian government recently increased coal customs duty to 2.5% from 2% for importing thermal coal. For coking coal imports, the customs tax has been increased to 2.5% from none previously. Also, a tax has been doubled on all coal consumption to 100 Indian rupees/tonne to fund the country's energy goals, Buckley said. In addition, there have been already calls from climate experts and environmentalists pressing India for the use of renewable and nuclear energy sources in order to satisfy the country's power needs, a news report suggested. Another factor that may slow down Indian imports is domestic electric utilities, the largest consumers of imported coal in India, were not stepping up coal purchases despite global prices hovering at multiyear lows. A report from The Economic Times said Indian utilities were unwilling to pay for costly power generated by plants running on imported coal. Indian utilities' surprise move comes at a time when thermal coal prices at the port of Newcastle in Australia, considered an Asian benchmark, are hovering around $70/tonne. The international met coal benchmark also has been down, with contracts for the second and third quarters settling at $120/tonne, marking the lowest level seen in seven years. Australia, the second-largest coal exporter in the world, is still seeing strong output growth from domestic coal producers. Major new expansions in Australia, expected to come online in 2014-2015, have been crossing out any advantage raised due to production cutbacks and active closures of mines, according to Buckley. Mines expansions from Peabody Energy Corp., BHP Billiton Ltd., Anglo American Plc, Whitehaven Coal Ltd. and Cockatoo Coal Ltd. "will add 30 [million tonnes per year] of new supply, [against] the 4 [million tonnes per year] of closures recently announced by Vale SA and Glencore Plc in Australia," Buckley added. Take-or-pay contracts were also deterring Australian coal producers to limit output, worsening the supply glut situation. "These long term contractual obligations are often US$15-30/t[onne] spanning 5-10 years and amount to hundreds of millions of dollars of contingent liabilities should a mine close," Buckley said. Coal exports from the major ports in Australia reached 18.3 million tonnes in May. Australia's Bureau of Energy and Economics had put the country's total coal exports target at 364 million tonnes in 2014. South Korea is one of the largest buyers of Australian coal, playing a major role in the Asian import coal market alongside China, India and Japan. 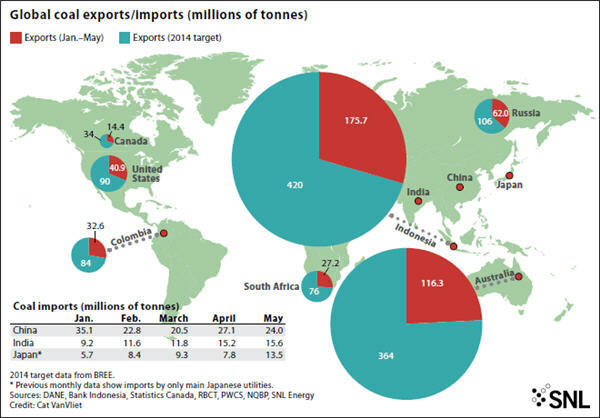 South Korea's coal imports are expected to touch 98 million tonnes in 2014, up 2.1% from 2013 levels, BREE said. The country has started imposing taxes on thermal coal imports from July, but, according to BREE, the law may not affect its coal appetite. "[South] Korea will provide a big boost to the [coal] demand-side. From now until 2017 it is adding around 12 GW of new coal-fired capacity, with the bulk of the additions scheduled for 2016. This will boost seaborne [coal] imports by 25-30 [million tonnes], and beyond that there are plans for even more coal capacity additions," Stefan Ljubisavljevic, an analyst at Macquarie Securities, told SNL Energy. Another Asian coal buyer, Japan, saw its coal imports reach 13.5 million tonnes in May, according to data from Trade Statistics of Japan. While Japan traditionally has been a massive importer of Australian coal, another major coal exporter, Indonesia, has been betting on coal demand growth from Japan amid collapsing Chinese demand. Indonesia exported 36.5 million tonnes of coal in May, up from 35.7 million tonnes shipped in April, data from Bank Indonesia showed. Indonesian coal producers have continued to boost their output, with production reaching 213 million tonnes of coal in the first six months of 2014, a news report said. However, the country has introduced rules to prevent exploitation of its coal reserves and retain the fuel for domestic purposes. Among the measures include capping annual coal production, as well requiring companies to register themselves with the government in order to export coal out of the country. Indonesia's domestic thermal coal consumption is expected to reach 151 million tonnes by 2022, according to a report. Besides Australia and Indonesia, Colombia and South Africa have been a major force in aggravating the global oversupply situation. Colombia increased its 2014 annual coal production forecast to between 94 million and 97 million tonnes, up from the previously estimated 89 million tonnes. This comes even though the coal operations saw several disruptions, including labor strikes. Thermal coal exports from the country are set to touch 84 million tonnes in 2014, compared to 77 million tonnes in 2013, which would pile up additional volumes in the global market. Colombia exported 12.5 million tonnes of coal in May, more than double from 5.4 million tonnes it shipped out in the previous month, according to Colombia's statistics agency DANE. Colombia exports most of its coal to Europe. Seaborne coal imports into Europe are expected to drift down over the next five years as the European Union policy on emissions, starting with the U.K., pushes coal off the grid, Ljubisavljevic said. "Currently, strong renewables generation and falling gas prices are also pressurizing European coal demand," he added. Coal shipments to Germany, one of the largest coal importers in Europe, totaled 17.9 million tonnes in the January-April period, up 5.5% over the year-ago period, according to data from a German coal importer association. Coal exports from the U.S. to Germany in the period totaled 3.8 million tonnes. Another country that is boosting exports is South Africa, which shipped out 5.6 million tonnes of coal in May, up from 5.5 million tonnes in April. The coal was exported from South Africa's largest coal terminal, Richards Bay. About 69% of coal shipped in May went to Asia, while Europe accounted 24% of the total coal exports, according to the data. U.S.-based coal producers have been particularly impacted by the oversupply situation and have curbed output in response to the low pricing environment. According to an analyst at Bank of America Merrill Lynch, U.S. coal exporters may not return to the seaborne market at current prices given their cash costs at the mine. Canada shipped out 3.5 million tonnes of coal in May, up from 2.7 million tonnes in April, according to data from a government statistics agency. South Korea was the largest receiver of Canadian coal, importing roughly 1 million tonnes of coal in May, while Japan imported 740,557 tonnes of coal in the same month, the data showed. Russia's coal exports in May reached 13.6 million tonnes, up 13.5% from the year-ago levels, according to Port News. In the five months through May, Russia's coal exports totaled 62 million tonnes, up 15.5% from the prior-year period, the report said. Russia's largest terminal of Vostochny, in the far east of the country, saw a 20% year-over-year surge in coal shipments in May, to nearly 2 million tonnes, according to data from Russia's Association of Commercial Sea Ports. According to BREE's earlier estimates, Russia may export a total of 106 million tonnes of coal in 2014, and is well on its way to meeting that goal. An expansion initiative for a planned coal terminal in Russia by debt-laden Mechel OAO was shelved by the company. The expansion, a report claims, would have created additional difficulties for Mechel, which has outstanding debts of over US$8 billion.